Just four stores were live in September. Talk about rapid globalization.A Japan iTunes store is in the works, but that country won’t be as simple as Canada. Character set challenges are never easy, particularly when it comes to text input, output and search engines. Nevertheless, Apple is going at a blistering pace and I won’t be surprised if I see 30 stores by the end of 2005. 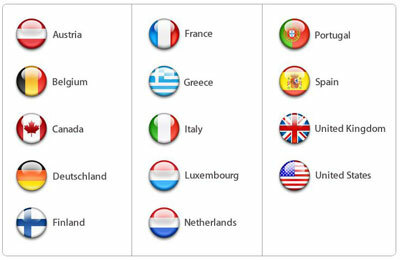 Now have a look at this: all flags but one are labeled in English. What kind of labeling is that? And if Germany gets its flag labeled in German, why doesn’t Austria, whose national language is German, too? Here’s an even trickier question: what languages are the French and the Portuguese flags labeled in?